Oil and gas are typically produced together. If oil wells are located near gas pipelines, then the gas gets used. But if the wells are far offshore, or it is not economical to get the gas to market, then oil companies get rid of the gas by burning it – a process known as flaring. According to researchers at Stanford University, in 2015, nearly 9,000 oilfields in 90 countries produced roughly 5% of all global greenhouse gas emissions by flaring gas. So, this is a huge source of carbon in the atmosphere. The industry needs to reduce the amount of flaring they do. One challenge is that most countries don’t even track flaring. Much of data on the subject has actually been obtained by satellite imaging of flares seen from space. Where there are regulations in place, there has been progress. 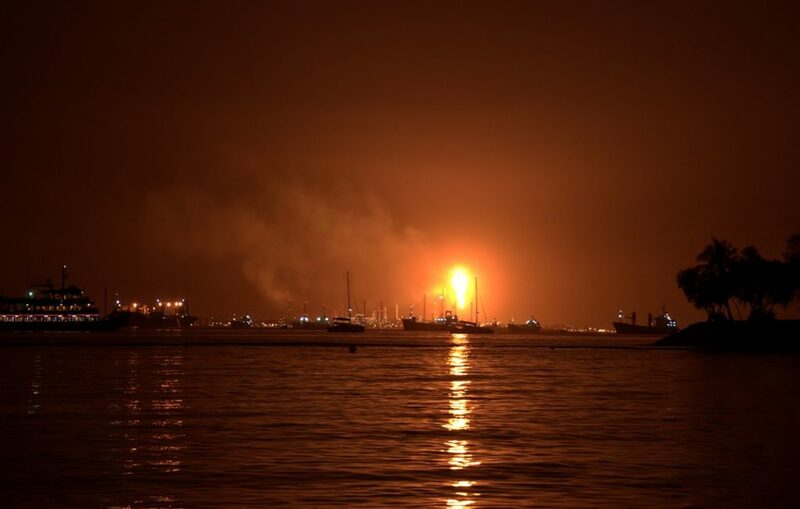 In Canada, offshore oil fields have to shut down if they flare too much. Excess gas has to be reinjected back into the ground, converted to liquified natural gas, or piped to customers. Here in the US, the current federal administration is unsurprisingly not aggressive on this topic. But various states are taking action. For example, North Dakota had wells flaring 30% of their gas and the state set a target of 10% that producers have actually met. Ultimately, it is the oil industry that must act. Fortunately, the gas has economic value, so not burning it off does not necessarily have to be an unacceptable expense for oil companies. The transition to renewable energy is well underway, but we will still be using a lot of oil and gas for the next few decades. It is essential to use them in the most responsible way possible, and that includes not burning gas just to get rid of it. Photo, posted March 13, 2010, courtesy of Flickr. ‘The Problem with Flaring’ from Earth Wise is a production of WAMC Northeast Public Radio.